I've been thinking a lot lately about the upcoming promotional and presentation work I will be embarking on when introducing the world to the app I've been working on with my team. Admittedly I'm getting a bit ahead of myself, as the app is currently still in beta and has some way to go. Nevertheless, I like to think ahead in order to get things right.. well get things right in my mind at least. I started thinking about why people are passionate about particular products, services, or brands - especially when there are other services out there that do the same job or provide the same or even better experience. The best example that I can convey and that everyone would easily understand would be Apple. One of the guys I am working on the app with is a complete Apple fanatic. He owns almost every bit of Apple kit out there - iPhone, iPad, iMac, Macbook Pro, Macbook Air, and Apple's take on DVR , Apple TV. He's not the only one too - plenty of others in my life are also Apple fanatic's, salivating at every Apple product launch and visiting the mothership (the Apple store) everytime they go to a shopping mall. I found a few great pieces online that talk about the way Apple communicate their message different to their peers, and how this sets them apart. Year after year after year, Apple seem much more innovative than their competition. Yet they are just a computer company. Just like their peers they have the same access to the same talent, the same expertise, the same consultants, the same media etc. Then why is it that they seem to have something different? The above circle, as simple as it may look, demonstrates how Apple inspires action compared to other computer companies such as Dell. 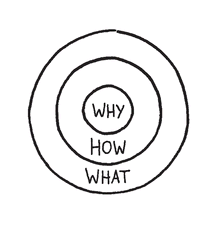 Every single organization on the planet knows what they do (outer circle). Some know how they do it (middle circle). Yet very few organizations know why they do what they do (inner circle). And by why I am not referring to making money, that's the result, that's always the result. By 'why', I mean what's your purpose, what's your cause, what's your belief? Why do you get out of bed in the morning.. and why should anyone care? Now as a result, the way we think, the way we act, the way we communicate is from the outside in. We go from the clearest to the fuzziest. BUT - the inspired organizations (regardless of their size, regardless of the industry they play in), all think, act, and communicate from the inside out. Going back to the Apple example, if they were to communicate like everyone else, a marketing message from them may sound something like this..
[What] We make great computers, [How] they are beautifully designed, simple to use, and user friendly, [Why] wanna buy one? ..And that's how most of us communicate. That's how most marketing is done, and that's how most sales pitches are done. It's even how most of us communicate interpersonally.. we say what we do, we say how we're different or better, and then we expect some sort of behaviour, a purchase, or a vote. It's not just Apple, we can take other examples..
[What] Here's our law firm, [How] we have the best lawyers with the biggest clients, and we always perform for our clients, [Why] do business with us. [What] Here's our new car, [How] it gives great mileage, it has parking sensors, leather seats, a 3 year warranty, [Why] buy our car. It's all uninspiring. Here is how Apple actually communicates (from inside the circle outwards)..
[Why] Everything we do we believe in challenging the status quo, we believe in thinking differently. [How] The way we challenge the status quo is by making our products beautifully designed, simple to use and user friendly. [What] We just happen to make great computers, wanna buy one? See the difference? Much more engaging, much more inspiring - start with the fuzzy then into the clear. This explains why everyone is comfortable to buy an MP3 player, a phone, and a DVR from Apple. Apple's competitors are all equally qualified to make these products also. In fact they've tried! A few years ago Gateway computers came out with flat screen TVs. Gateway were eminently qualified to make flat screen TVs, they had been making monitors for years. Guess what - nobody bought one. Dell came out with an MP3 player. Dell just like Apple make perfectly well designed computers. However, nobody bought their MP3 player. Why would you buy an MP3 player from Dell, why would you buy an MP3 player made by a computer company?.. oh but wait, we do it everyday! 1) People don't buy what you do, they buy why you do it. 2) The aim of brands and organizations should be to sell to people who believe what you believe, rather than to people who you think need what you have. Inspiring action and growing strong loyalty comes from people buying into your beliefs. That is why Apple can sell us DVRs, music players, and phones, while Dell is stuck selling laptops and desktops.